FT-1100 series media converter complies with IEEE802.3 standards, It is designed to convert data signal between 10/100 Base-TX and 100 Base-FX fast Ethernet. The media converter is connected between Fiber cable and twisted cable segments with networks operating smoothly. ·10/100Mbps and full/half duplex automatically configure in TP port. ·LED Indicators: POWER, FX LINK/ACT, 100, TP LINK/ACT, FDX/COL. 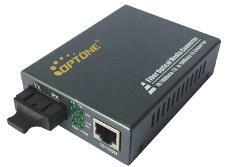 Our Fiber Optic Media Converter Boxes come with many options, depending on the application. We offer single-mode, multimode, different wavelengths such as 1310 and 1550, WDM, and various lengths including 2km, 25km, 40km, 60km, 80km, and 100km.